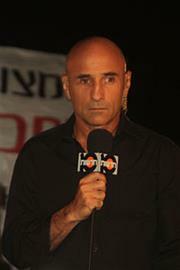 Ofer Shelach, a writer and journalist, was born in Haifa in 1960. He served in a paratrooper unit during the 1982 Lebanon War, where he lost an eye. He later published a book about his experiences, Second Person. Shelach studied economics and English literature at Tel Aviv University and spent two years in New York studying creative writing. For 25 years, he worked as an editor for the popular daily Maariv, wrote for the mass circulation daily Yedioth Ahronoth, and hosted popular news and sports programs for Israel TV. As a journalist, he wrote a great deal about security issues. Since Israel's elections in 2013, Shelach has been a Member of Knesset; he is Parliamentary Group Chairman of "Yesh Atid". He has been awarded the Book Publishers Association's Platinum Prize for Captives in Lebanon (2015) and the Yitzhak Sadeh Prize for military literature (2016).